The devastation the fire has had on our community is immeasurable. With continuing threats of hotspots and fires skirting the edges of the city, emergency responders and other personnel have been working tirelessly these past few days to keep our community safe and return our citizens as soon as possible. On May 14, the Government of Alberta released high-level satellite overview images of the status of the city after the wildfires. Over the past few days, technical specialists have been working to provide higher-resolution images in order to provide a more accurate depiction of the state of homes in the municipality. Viewing these high-resolution images will be difficult and troubling. Some will want to see these, and some will not. I caution all citizens viewing these images to keep this in mind. No words can describe the emotions these images will convey and the devastation we have experienced. We as a community are in this together. Alberta’s Mental Health Help Line is available 24 hours a day at 1.877.303.2642. More information about the resources available to you is available at www.emergency.alberta.ca. The Government of Alberta continues to battle wildfires in the region, as well as ensuring the city’s services are restored and the area is safe for when residents return. Everyone is working very hard to bring our citizens back. We are Alberta Strong and we will rebuild Wood Buffalo together. The information provided in this website is a point in time glimpse of residential areas in the Regional Municipality of Wood Buffalo (RMWB). It was created to provide information to evacuated residents of the RMWB. It is not designed or intended for use by the general public or for commercial purposes. The information is maintained by the RMWB and is subject to change. At the time of providing the information the RMWB remains under mandatory evacuation order. There continue to be active fires within the region and the situation is changing and dynamic. The information you see may not reflect actual current status of your home or property. Users agree to hold the RMWB and its officials, officers, employees and authorized representatives harmless from and against all claims, damages, losses, or liabilities arising in any way relating to the information provided by this website. The RMWB provides the information in good faith while acting under a state of emergency declared pursuant to the Emergency Management Act, RSA 2000 c. E-6.8. Pursuant to sections 27 and 28 of the Emergency Management Act, no action will lay against the RMWB, or a person acting under the RMWB’s direction or authorization, for anything done or omitted to be done in good faith while carrying out a power or duty under the Emergency Management Act or the regulations. Viewing the information may be traumatic. Remember that you are not alone in this. Alberta’s Mental Health Help Line is available 24 hours a day at 1.877.303.2642 and more resources can be found at www.emergency.alberta.ca. The Regional Municipality of Wood Buffalo, in partnership with the Government of Alberta, is pleased to provide evacuees with an online damage assessment map for residents to assess the potential damage of their property. Upon your return, there will be a process in place for access and assessment. Following a review of your property, please review the frequently asked questions (FAQs) and useful links below. When will I be able to return home? Although the Regional Municipality of Wood Buffalo remains under a mandatory evacuation notice, the Municipality is identifying a phased approach for re-entry. More information will be provided regarding safety guidelines at a later date. Will I be allowed to go through my damaged home? For your safety and the safety of your neighbours, and to allow your property to be left as is, your property will be fenced off. There will be a process in place – which will be announced at a later date – to allow residents to visit their property. Processing the recovery of your home will be in conjunction with the Municipality on a case by case basis. For all insurance related questions, contact your insurance provider. If you have broad insurance questions, you can contact the Insurance Bureau of Canada at www.ibc.ca or 1-877-227-5422 (Customer Service). If you are not insured, contact the Canadian Red Cross at 1-800-565-4483 or www.redcross.ca. If your home has a mortgage, call the bank or company that holds this mortgage to let them know about the wildfires as soon as possible. Fire damage can temporarily reduce the value of your home, but once the damage has been repaired, the value will return. 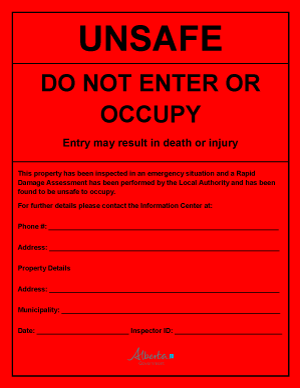 Rapid Damage Assessments (RDA’s) are performed when an emergency situation has occurred. These emergency situations could be a wildfire, flood, tornado or earthquake. 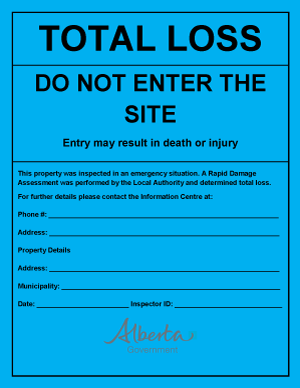 RDA’s are completed by Safety Codes Officers (SCO’s) who have the authority in a given jurisdiction to inspect structures as per the Alberta Safety Codes Act. 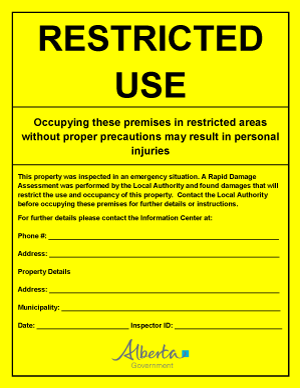 The SCO’s enforce the applicable Building, Electrical, Plumbing and Gas codes to ensure buildings are safe occupancy. The Safety Codes Officers’ Rapid Assessment is a visual exterior inspection that verifies there are no significant unsafe structural, electrical and gas conditions that would prevent the safe occupancy of a structure. No homes were entered during the inspections. In addition, there may be other hazards on the property that may have been identified by the safety codes officer. These hazards must be addressed and are the responsibility of the home owner to ensure they are resolved so that anyone that may or could be on the property are safe. If there is a red or yellow placard on your house, further information on what this means for re-occupation of your house will be provided prior to re-entry. If you do not have a placard on your house, your home is safe to occupy after the evacuation order has been lifted and in accordance with re-entry timelines announced. Although a Safety Codes Officer has deemed your home ok to occupy, other hazards may be present within your home. Such hazards may include, water damage in your basement from a sump pump failure during a power outage, smoke damage or spoiled food. Please refer to your welcoming package or visit www.rmwb.ca/ymmfire for more information on how to deal with damages from the wildfire. Wildfire recovery information. Get the latest updates from the municipality.View here.